I'm looking forward to scrapping the pictures that I took on our recent weekend vacation and it has me looking back of some vacations-past...especially this one from when we visited a Renaissance fair in Minnesota a few years ago. 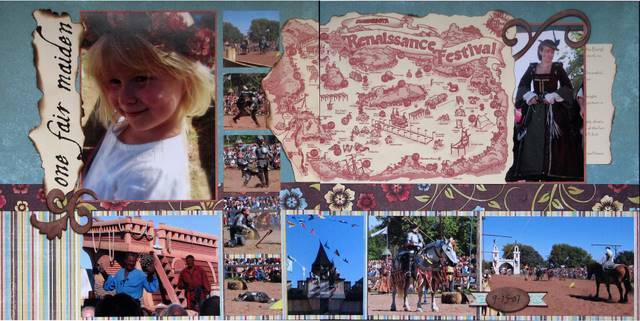 I had a lot of pictures that I wanted to include on this layout, especially of the jousting tournament, so my square punch came in very handy. I also had the map of the grounds from the festival brochure and I thought it would be a great addition to the page. I was going to tear and ink the edges, but then thought “Why not just burn it?” which would give it a much more authentic feel for the period. So I did and I love how it turned out! In September 2007, Kaitlin and I took a weekend trip to Minnesota for a family wedding (Chris & Samantha Bang) with Mom & Dad, Lee, Lynn & Chris. Lynn had gotten some free tickets to the Renaissance Fair through work, so we decided to check it out on Sunday before heading back. It is certainly an amazing event…the costumes and colors were all so beautiful. We were also lucky to have a beautiful, sunny day. I was probably more ‘enchanted’ by the whole affair than the rest of my family, but I’ve always been interested in this type of thing. One of my favorite parts of the day was watching the jousting. It felt quite ‘real’. Our knight was the green knight. And he fought valiantly. But he did not win...he was a loser...yup, that's him face down in the dirt in the final picture in the row of mini-pics. And the picture with the gentleman holding the rose and the mug of ale…that’s Puke & Snot. You heard right...that's really their names (at least during the Renaissance Fair, that is). Evidently, they are the #1 act to see when at the fair. They were quite funny...a little off-color (come on...what did you expect from two guys named Puke & Snot? ), but definitely funny. Fortunately, the off-color stuff was mainly over my fair little maiden’s head. I would have liked to stay longer, but everyone was a little tired and we still had a long drive home…hopefully we’ll have another chance to revisit the Renaissance Fair – maybe even in costume next time!